This article is 75 days old. She was taken to the Humane Society where emergency care was initiated to raise her body temperature, and she continues to receive intensive veterinary treatment. In addition to her immediate medical concerns, the cat was found to have fur so tightly matted that it was trapping urine and cat litter against her skin. 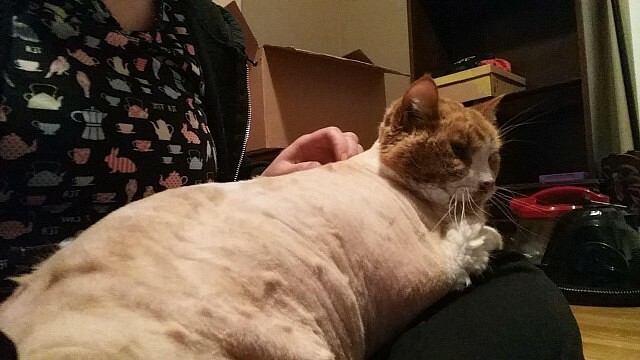 Officials say that this appears to be due to ongoing neglect, and had been occurring for so long that the skin on the cat’s underside had become necrotic under the matted fur. About a week later her condition did stabilized enough that she was able to move into a foster home with one of their medical team members. Humane Society officials said that even after her condition stabilized, she was still having difficulty walking. After they took x-rays of her paws, they found that she is suffering severe complications from being previously declawed, impacting the bones and tendons in her paws. She continued to improve slowly, but they say that Saturday morning she woke up crying. Her foster mom rushed her to an emergency veterinarian where her body temperature was found to be low, but nothing else has yet been found that could explain her symptoms beyond possible long termdamage from her initial hypothermia that has never completely resolved. We are saddened to let you know that Elsa passed away today. Her neurological symptoms continued worsening, and despite active warming efforts she continued to be hypothermic. The Humane Society veterinarian who has been treating her consulted with the emergency veterinarian, and both agreed that the kindest option was to let her go. She passed peacefully in the arms of her foster mama. We all hoped to give Elsa the happy ending she deserved, but sadly, sometimes that’s out of our hands. Please hug your kitties tight tonight, and give them an extra treat in Elsa’s memory. Anyone with information about who may have owned or abandoned Elsa is asked to call the Windsor/Essex County Humane Society cruelty investigations department at 519-966-5751, ext 16 or Crimestoppers at 519-258-8477.